This 2017 model Grand Banks 44 Eastbay SX is in excellent condition and ready to cruise! The Volvo extended warranty covers main engines and pods, until Dec 1, 2021 or 1,000 hours. 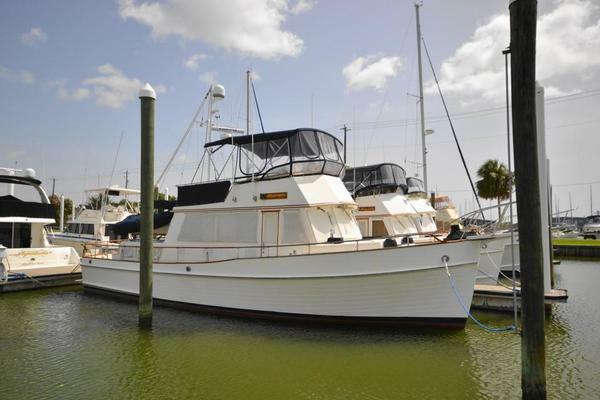 This GB44SX features a 2 stateroom, 2 head layout both with separate stall showers, and a 3rd stateroom or utility room, large airy salon with 3 large opening windows and easy sight lines, Volvo Glass Cockpit with two (2) 8215 Garmin screens, large comfortable aft deck with built-in seating and removable awning, easy walk around sidedecks with mid-boarding gate, and so much more! More detailed specifications and professional photographs available soon. Starting in the cockpit there is standard aft L-shaped seating with storage below, aft facing seating on the port side forward, and a large storage cabinet or space for exterior refrigerator and icemaker on port & starboard sides forward and outboard. The aft port side window drops down electrically and hides away to give a totally open feel from inside to outside and provides flow-through ventilation as well as a pass through to her cockpit. The same opening window design is on the forward starboard and port windows as well as two large easy to use sliding hatches. Moving inside to port, there is a large comfortable-settee or lounging area with a custom teak bi-fold table. On the starboard side is the galley featuring deep stainless steel sink, separate filtered water, induction cooktop, Isotherm DR160 refrigerator/freezer drawers and plentiful storage. 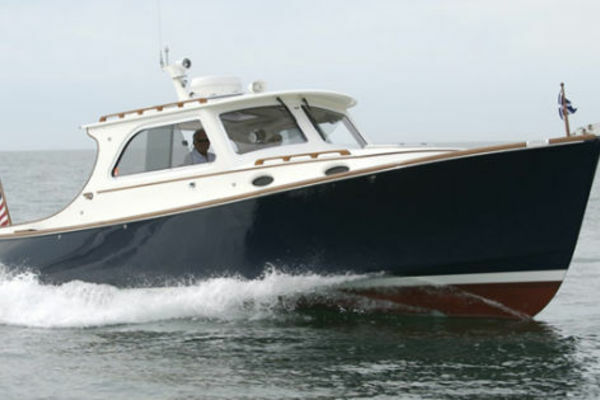 Moving forward, the helm features a custom designed bench helm seat and a properly laid out and engineered helm panel for engine instrumentation, other gauges and your electronics selection. Heading below, The master stateroom is forward with a low profile queen-size very comfortable master berth with storage below, hanging lockers on both port and starboard sides, plentiful storage and natural light through opening ports and hatch above. This master has a private en suite head with separate stall shower. The guest stateroom is aft and to port and features a large island queen berth and a private access to the guest/day head also featuring a separate stall shower located just forward of the guest cabin. To the starboard side of the companionway is a large utility room/third stateroom with abundant storage, Splendide vented washer/dryer, additional Isothern refreration/ freezer drawers, and space to store any other convenience you would like. For power she features twin Volvo IPS 600 propulsion with joy stick control for the optimum in easy handling, maneuverability, quietness and performance. Her exterior features full walkaround side decks, proper stainless steel grab rails, non-skid side decks and much more. Electric horn: DC, single "trumpet"
Canvas Cover Package: Sunbrella exterior canvas covers for cockpit settee & cockpit lockers; color: "Toast"
Countertop, Silestone, Color: "Tigris Sand"